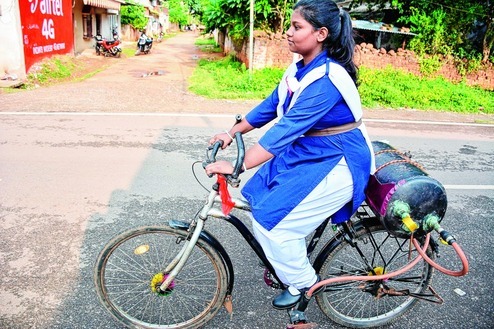 HomeEnvironmentHuman PoweredTransportVehicleIndian Girl Aims for Pollution-Free World Invented an ‘Air Bike’ Runs on Compressed Air! Indian Girl Aims for Pollution-Free World Invented an ‘Air Bike’ Runs on Compressed Air! India has been one of the biggest sources of inventions and discoveries if we look into the history. If we say that India is the land of inventions then we do not think you would be amazed about it. An Indian girl from Rourkela aims for a pollution free world where there are no fossil fuels powered vehicles running on the roads. 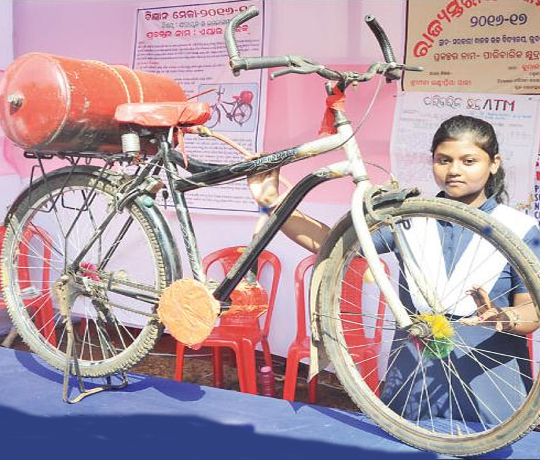 Tejaswani Priyadarshani, a 14-year-old 9th std student of Saraswati Shishu Vidya Mandir in Odisha has invented a bicycle called ‘air bike’ that runs only on air pressure. It can run up to 60 km on just 10 kg of compressed air pumped into a cylinder mounted on the bicycle carrier. She inspired for the invention when she was at a bicycle-repair shop where the mechanic using a simple air gun to detangle knots in a bicycle tire. How does ‘air bike’ work? A compressed air tank having an inlet for filling the air, attached to the carrier of the cycle. A measuring dial and a starting knob along with a safety valve provided to release the excess air. Air from the cylinder passes to an air gun when the knob is turned on, that rotates the gear near pedal using six different blades and propels the bicycle.